Congratulations to our Lake Havasu Schools for our outstanding achievement. Today the state released the letter grades based upon the 2017-2018 school year. Elementary and Middle School Grades are based on the percentage of students who score proficient on AZMerit as well as the percent of students who show growth from the previous year. Also included separately are how well our special education and English learner students perform. Absence rates, the percentage of students tested, and the number of students in advanced courses are included in the letter grades. 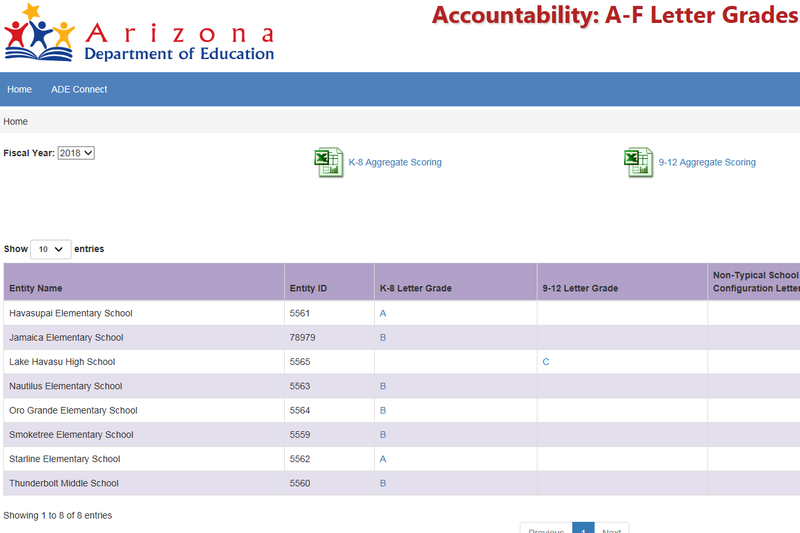 High School letter grades include the items noted above, but a greater indicator weight is placed on proficiency on the AZMerit. Also included is growth in graduation rates. A major category for the high school grade is an area called College and Career Ready Indicators or CCRI. CCRI includes areas such as the number of students who complete the FAFSA, or who meet cut scores on the ACT or SAT, or students who earn CTE certification for industry, or students who meet the cut score on an A.P. exam. Our entire team of teachers, staff, and administrators have worked to ensure that our Lake Havasu students receive a quality education. While we always are working to improve- to be the very best- we congratulate them all on this achievement.